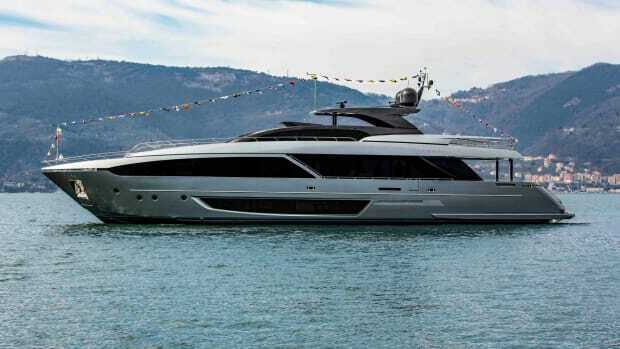 Italian builder Riva goes long with its new flagship Mythos 122. The iconic brand Riva is best known for its sensuously stylish open runabouts, the Aquariva and the Rivarama—living classics. 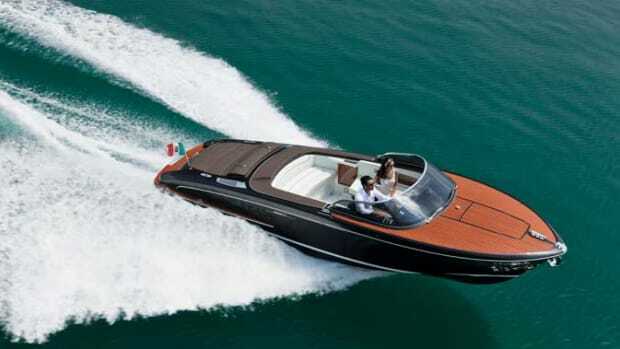 The very name Riva conjures la dolce vita. Shahs, sultans, socialites and screen stars have been famously photographed zipping along the Côte d’Azur with hair streaming, scarves flying and sunglasses reflecting the sparkling brightwork of their Rivas. 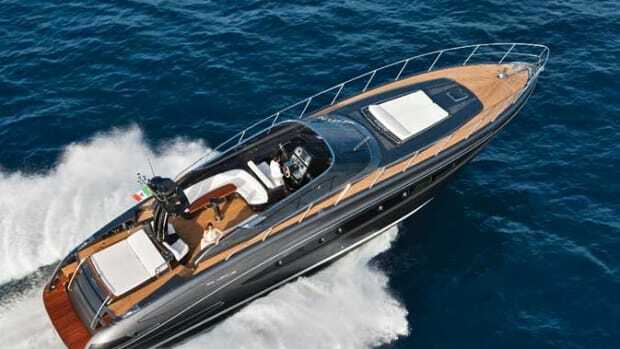 Since the 1970s, Riva has been expanding its range and building progressively larger boats. During the past 14 years, the company has developed nearly a dozen models, all built in fiberglass, between 27 feet and 86 feet (8.2 meters and 26.2 meters) in length. 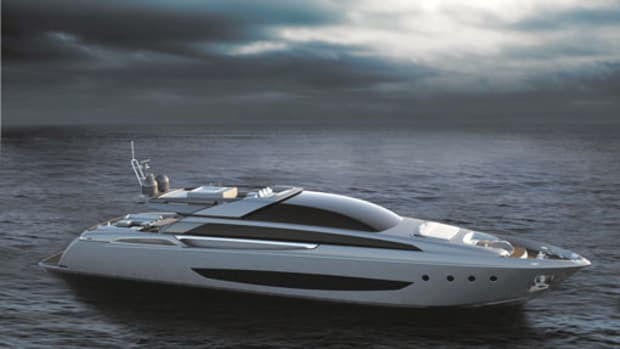 The introduction this summer of the all-alloy Mythos 122—measuring 123 feet (37.5 meters) in overall length—signals Riva’s transcendence from medium-size boats into the world of superyachts. First from mahogany to fiberglass, and now from fiberglass to aluminum, the Riva brand has evolved not only in size, but also in applied technology and supreme detailing, and now into a new classification with its RINA Green Plus certification. Stepping aboard the Mythos, the evolution from the 86-foot Domino—the builder’s previous flagship—is apparent. The DNA is the same, but every aspect has been stretched to create more space and tweaked to be more efficient. The designer, Mauro Micheli, who has been working with Riva since 1985 and designing Rivas with his own signature since 1992, says that while the concept and the lines were conceived in about 10 minutes, the level of detailing has been amplified. For instance, utmost consideration was given to how the exterior profile would read. The exterior colors were conceived to complement the yacht’s aerodynamic profile. The extensive side windows were given a transparent glazing to appear black, complementing the bright black of the superstructure. 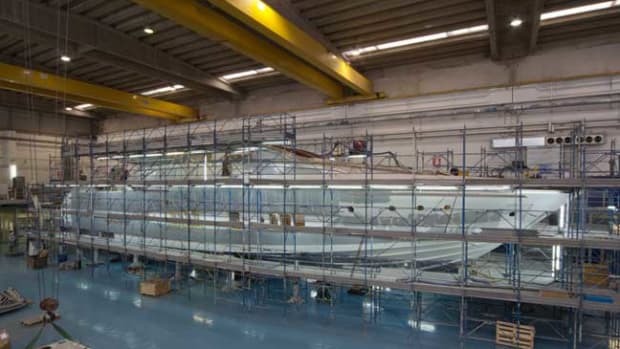 The metallic hull color was created in-house and named Regal Mythos Silver. The overall effect is stunning. 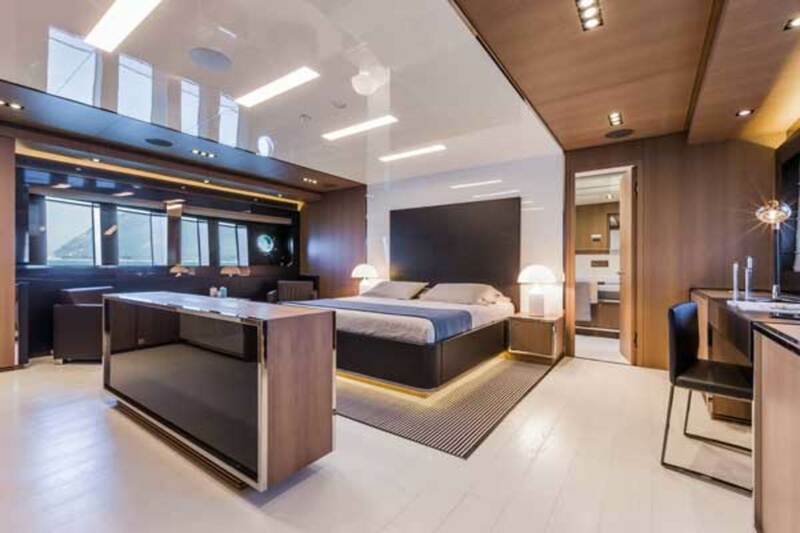 The full-beam master stateroom, finished in wood, leather and stainless, has a centerline stowage unit that conceals a pop-up 46-inch TV. Built at the CRN shipyard in Ancona, the Mythos is a 163-ton planing flybridge motoryacht. 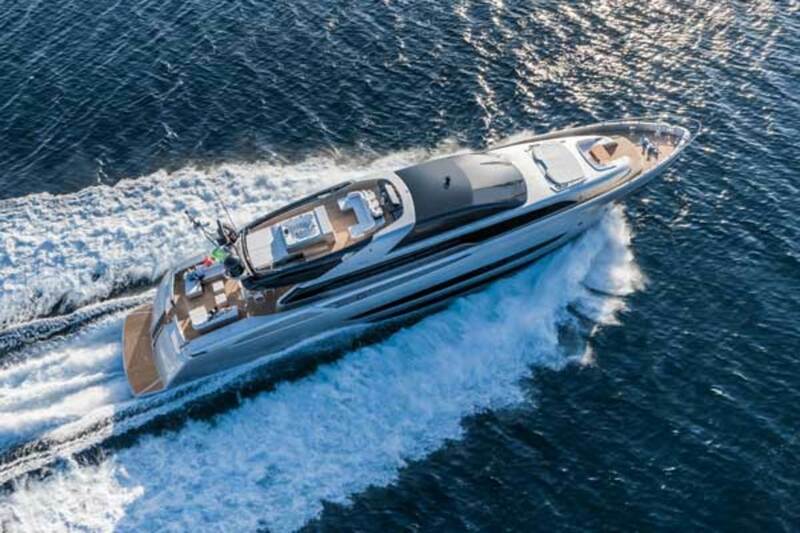 Her twin 3,510-horsepower MTUs deliver a top speed of 28.5 knots and a comfortable cruising speed of 25 to 26 knots, according to the builder. Noise and vibration are greatly reduced thanks to a shaft-drive propulsion system with a freestanding gearbox. Her propellers are designed to improve range and fuel consumption. 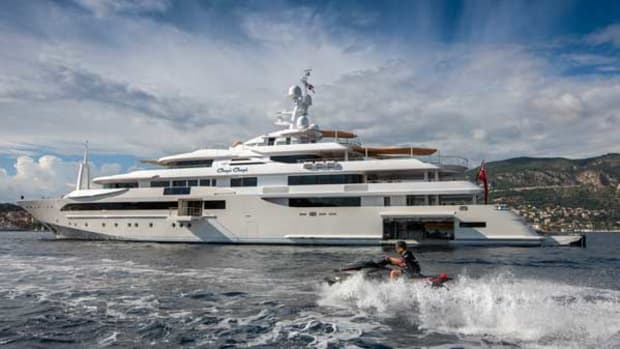 In fact, Riva conceived the entire yacht with an eye toward reducing negative environmental impact, which helped earn her RINA’s Green Plus class notation. One criterion is reduced CO2 emissions. Based on the RINA scoring system, the Mythos achieved high marks for her anti-pollution features, including the way in which she handles waste—black and gray water—and her anti-fouling systems. Points were also accumulated for her use of eco-friendly building materials and energy-efficient systems such as LED lighting. The head in the master has a large shower room and an adjacent separate sauna. While receiving praise for her green technology, the Mythos also deserves kudos for her pure Italian design, which is clean and modern. Like her predecessors, she is truly timeless. The cockpit is a sun-worshiper’s dream, with two L-shaped sunpads and coffee tables aft, and a teak and stainless steel dining table that seats 10. This outside living room flows seamlessly into the main salon through glass doors, effecting a blend of indoor-outdoor living. Enveloping windows offer a panoramic view of the world outside. The interior is dressed in Canaletto walnut, white leather, glass and stainless steel with contrasting color accents from loose furniture, which includes a brown leather-lined coffee table and brown leather dining chairs. White-lacquered bulkheads and cabinets enhance the brightness of the space and make the interior feel even larger than it is. Unusual among Italian yachts, the Mythos has a full-beam galley forward of the dining area on the main deck with an eat-in banquette. Also uncharacteristic of Italian style, the galley is designated as part of the owner’s domain. The crew have their own mess and service area on the lower deck adjacent to their sleeping quarters. The owner enjoys cooking, and his spacious, practical galley suits his family’s lifestyle. 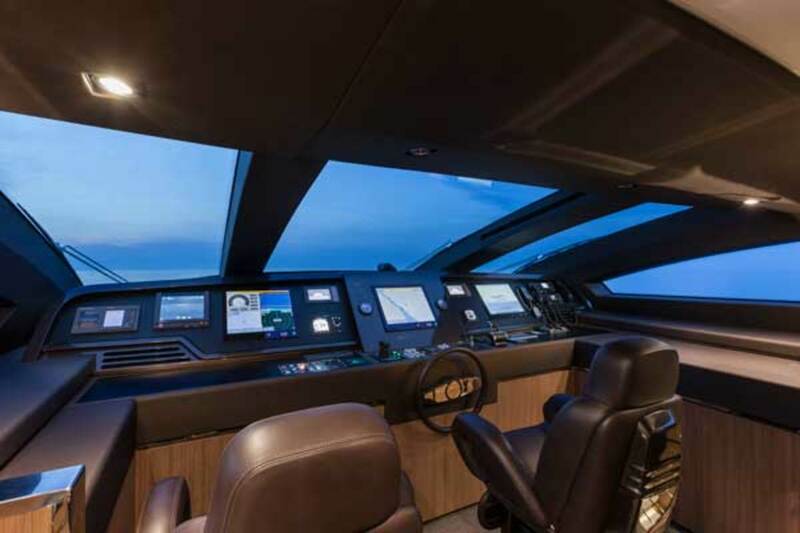 In fact, there are numerous places for the owner and guests to partake of repasts and cordials—the aft cockpit, the inside dining area, the galley, the foredeck settee and dining table, and the top deck. The flybridge boasts a Jacuzzi and a bar/lounge. This debut Mythos was built for an experienced owner who traded up from his 86-foot Domino, and Riva accommodated certain customizations. The standard configuration has four cabins. This one has three. (Future Mythos models can be configured with as many as five.) The owner wanted a large master and two flexible VIPs. The master suite is quite generous with sleeping quarters, a separate head/bidet, bathroom, shower, sauna and study/vanity area. White is a repeated theme from the rest of the boat with the use of Thasso marble, Corian washbasins and a separate sauna with a white settee. The matching guest staterooms mirror the master suite in terms of their plentiful natural light and light décor. Another option exercised by this owner was having a Jacuzzi surrounded by sunpads on the top afterdeck. Jacuzzis are not standard, as a full bar was planned in lieu of the hot tub. 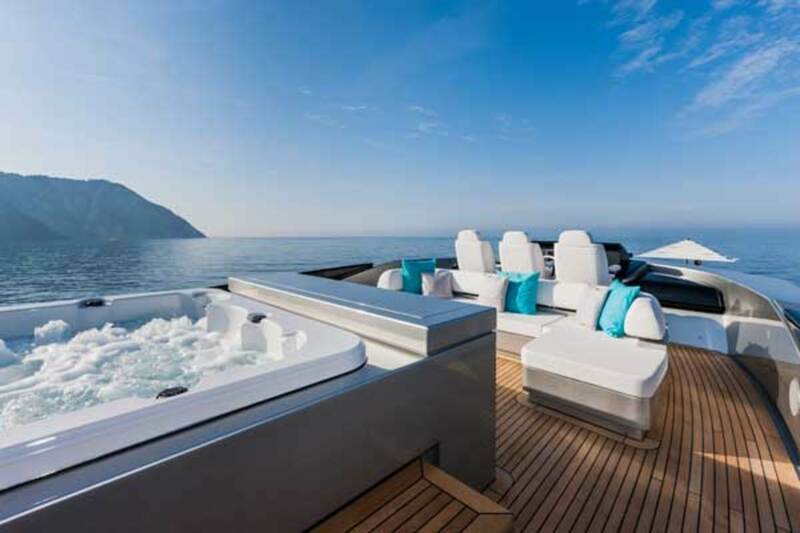 On this yacht there is a semi-bar unit forward with a rear-facing settee abaft the helm. 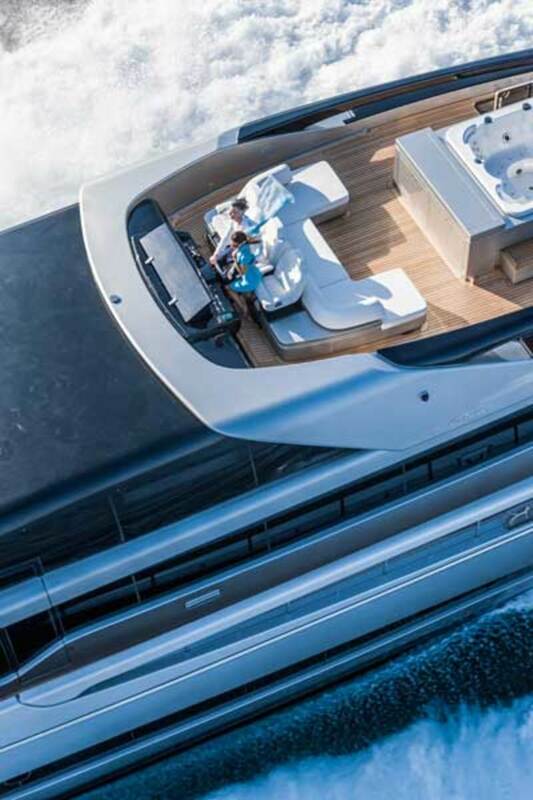 The flybridge, and indeed all areas of the boat, is accessible from the main-deck aft cockpit. An external staircase from the cockpit leads to the upper deck. 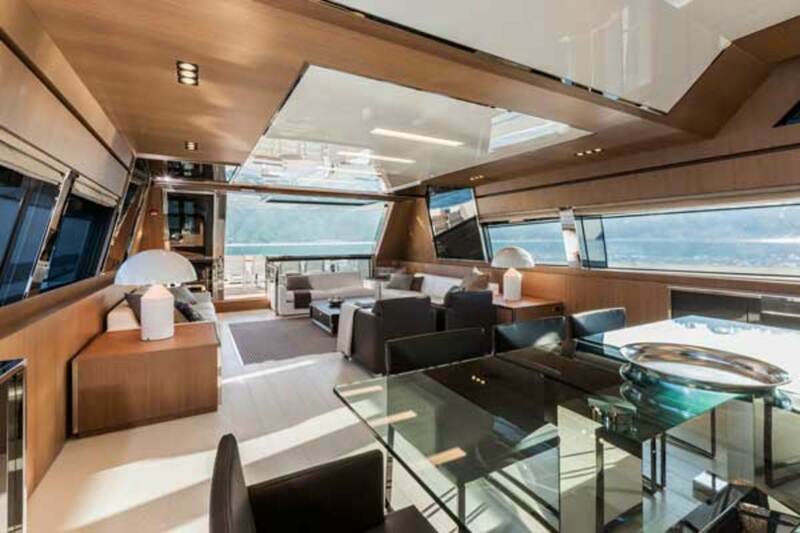 The foredeck has sunpads, a dining table with settee and built-in refrigerators housed in hinged lazarettes. A pop-up bimini shades the entire area. The pilothouse offers great visibility. The lower deck has a swim platform and garage, which houses a 16-foot (4.8-meter) tender and a personal watercraft, and there is an electro-hydraulic platform for diving and easy deployment of the toys. “This yacht is as easy as they come: easy to drive, fast in getting there and a comfortable ride,” says the captain, who skippered the owner’s Domino. With the Mythos, it’s easy to see why Riva has endured for more than a century and a half. Riva’s roots date back to 1842, when a 20-year-old Pietro Riva, hailing from Laglio, Italy, left home armed with a simple craft he learned from his father, who is thought to have built barges that carried sand and bricks—a far cry from the yachts that eventually would bear his family name. Riva’s travels led him to Sarnico, where he applied his skill to fishing boats, then to Lake Como, where he gained a reputation for boatbuilding and repair. His son, Ernesto, introduced internal combustion engines on Rivas, and Ernesto’s son, Serafino, made the evolution from boats as transportation to powerboating in the 1920s and ’30s. It was Carlo Riva who, in the 1950s and ’60s—the heyday of the Riva runabouts—elevated the brand to its greatest stature. He designed many Riva models, always experimenting and evolving with the times. 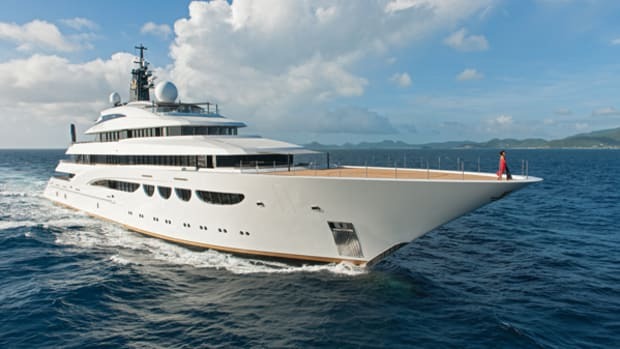 In 1970, he established a partnership with CRN Shipyard. Between 1970 and 1978, he built six 77-footers (23.4-meters) in the Marco Polo series and two Vespucci models: a 90-footer and a 100-footer (27.4-meter and 30.5-meter). Since then, Riva has undergone many permutations and benefitted from outside designers and builders. 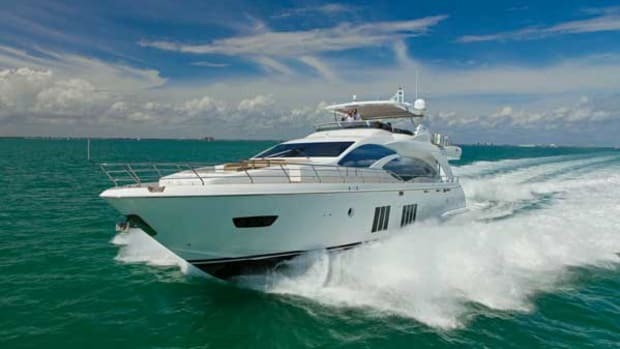 It has been owned by the Ferretti Group since 2000. While Riva is no longer a family-owned business, the brand still shines. 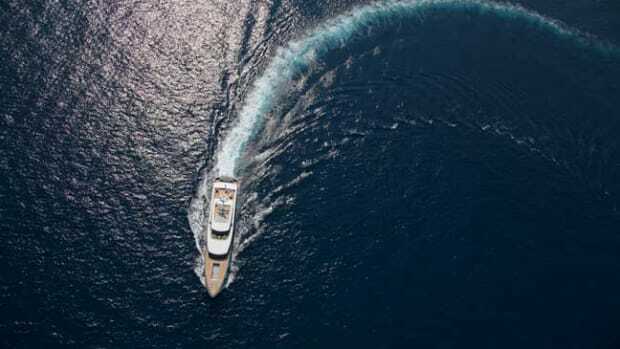 Driving from the flybridge creates a sense of thrill and excitement.